I imagine that being woken in the middle of the night by, say, a cat burglar would be pretty bad, but surely not as horrific as being roused from slumber by a small voice saying, “Mummy, I wet the bed”? The child may as well be saying, “Mummy, the dam has broken and we are under flood.” Get out while you can – night-time wees are huge. Which is exactly why wet mattresses are just a fact of life. You try to protect the mattress and bedding all you can, but that dam is going to burst at some point. Most kids I know have weed straight through a mattress protector and a set of flannel (supposedly super-absorbent) sheets at some point. Mattresses are vulnerable things. There are two things that urine will do to a mattress if left unattended. Within 24 hours the mattress will start to smell like the inside of a men’s public toilet and be warned, once that urinal smell sets in, it’s almost impossible to remove. Add to that the fact that the inside of a mattress, plus moisture makes the ideal breeding ground for mildew and mould and it’s quickly apparent that if you don’t act quickly, you may as well donate the wet mattress to landfill. To this end, our attack needs to both wick moisture away from the inside of the mattress and neutralise the odour-causing bacteria in the urine. So what we need to build is a two-fold wee-busting kit. Add 2 parts vinegar to 1 part water to your spray bottle. Then add two capfuls of tea tree oil. Shake to mix. Mix equal parts Borax and bicarbonate of soda. Much as it pains me to tell you this, you need to get out of bed the minute you hear that the bed has been wet. I’m not suggesting that you launch into a full-scale laundry wash at 2.47am, but to save the mattress you do need to do two things urgently. 1. Get the sheets and covers off the bed immediately. The longer they stay on, the more wee the mattress will most likely absorb. 2. Spray the wet area with a generous dose of wee-busting spray and then lay at least two old towels on top. Layer thick sheets of newspaper on top of the towels and then pile a heap of books on top of the towels. The spray will start to neutralise the urine and the towels will hopefully wick away some of the moisture from the mattress. The newspaper and books are to give the towels something to read. Just joking – the books will weigh the towels down, forcing the fibres to absorb moisture. The newspaper is there to protect the books from the wee. Tip: Keeping a stash of old towels and a newspaper in your child’s wardrobe might be a good idea. If the night is still young and you are feeling perky, by all means dump the rest of the urine-soaked bedding in a tub of super-hot water with a cup of vinegar and a capful of tea tree oil, but if not, just go back to bed. You can sort the rest out in the morning. If you didn’t manage to get to it in the middle of the night, bright and early next morning is the time to put the bedding into a tub of super-hot water with a cup of vinegar and a capful of tea tree oil. Add the towels that you left on top of the mattress overnight. Leave the lot to soak while you tackle the mattress. Once you’ve tackled the mattress and it’s drying in the sunshine (see below), put the bedding on to wash with the hottest water temperature on offer. Wash with your usual washing powder plus a cup of the wee-busting powder. Add a cup of the wee-busting spray formula into the ‘fabric softener’ dispenser. Wash on your longest cycle and hang out to dry in the sun for a full day. Drag the mattress outside and lay it down flat somewhere (a deck, a patio, a pathway). Put a fresh towel down on top of it and stomp around a little. The kids are good to employ for this bit (you are standing in wee, after all …). You’re trying to get as much moisture up out of the mattress as possible. 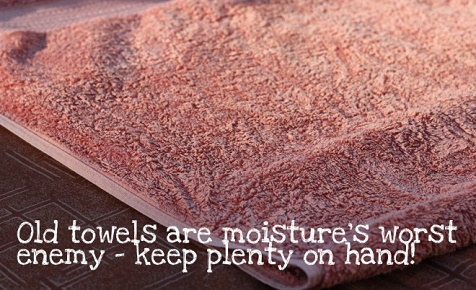 Once the towel is no longer absorbing anything new, add it to the soaking sheets in the laundry tub and move on. Next, prop the mattress up on four kitchen chairs (one on each corner) in the sun. You want the mattress flat for this part, but you don’t want to lay the mattress on the floor because you need to allow as much air to circulate around it as possible. 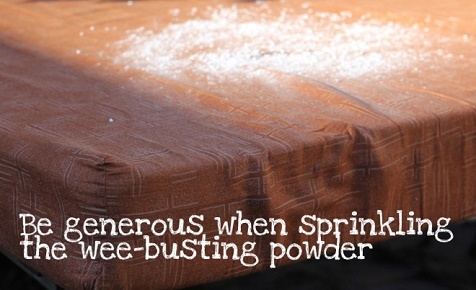 Sprinkle the mattress with a generous dose of wee-busting powder. Leave in the sun until the powder is dry (generally a couple of hours, depending on the heat of the sun). Once dry, vacuum off the powder, spray with the wee-busting spray, sprinkle with wee-busting powder and leave to dry once more. Once dry, vacuum off and (bleeee!) give the mattress a sniff test. Hopefully you won’t need to repeat the spray/powder formula, but by all means, go for it if you have to. Once the urine smell has left the mattress, lift it off the chairs and prop it up on its edge somewhere sunny where air can circulate freely. Leave until completely dry and bring in at bedtime. Actually, if your child can sleep elsewhere for a night, bring the mattress inside at nightfall, sprinkle again with the wee-busting powder and leave overnight. Vacuum in the morning, take the mattress outside, spray with the wee-busting spray and leave to dry all day in the sun. Ah, okay, but what if it’s a rainy day? Sigh. The best-laid plans and all that, right? Because while “Mummy, I wet the bed” is exhausting to hear, “Mummy, I wet the bed” sung to the tune of rainfall is positively depressing. If you can’t get the mattress outside on a sunny day, the next best thing is to create your own heat and air. I’ve heard talk of using a hair dryer to get a urine-soaked mattress dry, but in my book that’s akin to trying to stop Niagara Falls with a bathplug. You need power and might if you’re going to save a mattress. Go through the night-time ‘speed’ steps as above. In the morning, prop the mattress up inside on your four chairs and sprinkle with the wee-busting powder. Set a portable heater up next to a portable fan right by your mattress (make sure you follow the manufacturer’s safety instructions) and turn both on full. Leave until the powder dries then vacuum off the powder, spray with the wee-busting spray, sprinkle with wee-busting powder and leave to dry once more. Repeat until there is no urine smell and the mattress is fully dry. On the first sunny day, take your mattress outside and prop up so air can circulate. Spray with the wee-busting spray and leave in the sunshine to dry completely. Don’t wait for the floods to hit – use the wee-busting powder and spray technique to freshen up any old mattress any time. The combination of spray, powder and sunlight is kryptonite for dustmites. How are kids using the internet?